Imogen's Typewriter. 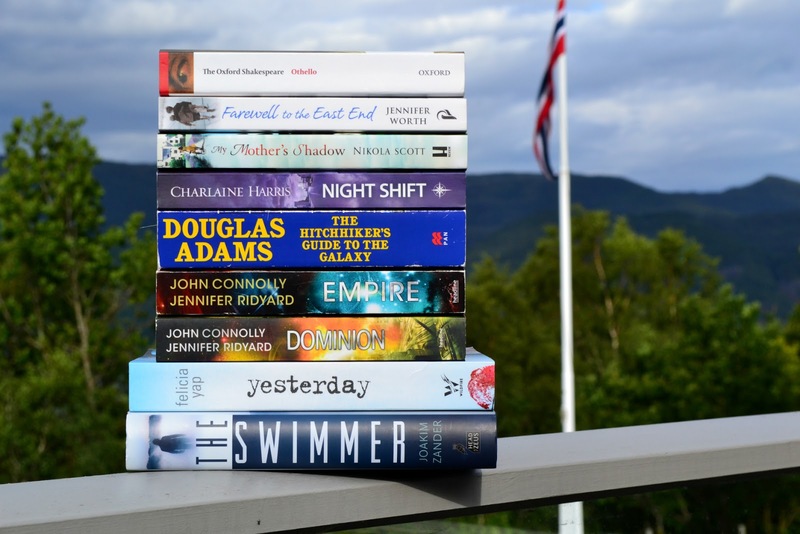 : Books I Took to Norway! Books I Took to Norway! In an attempt to get as far ahead as I can in my next module before it starts and I inevitably fall behind, I brought one of my set texts away with me so I could really get my head around it. I mean, it's Othello, what can I really say? He actually made a two hour flight go by in a flash! This was actually the first book I finished on my holiday, reading it on the train from Oslo to Bergen. After starting this series in October of last year and really enjoying the first book, then being really disappointed by the second book in May, I wasn't sure what to expect. I just really wanted something with short chapters that I knew I could put down and pick up a lot without losing too much of a continuing plot. This is a slow, savouring read that I've been really enjoying for a while now. I didn't want to leave it at home for a fortnight. I even saw a woman in the airport looking at a copy in WHSmith and after dithering about in shy anxiety for a minute, was that person and told her it was really good. Now, I took this to Corfu along with the first two books in the trilogy and read those. But I didn't get around to this one and decided to save it as a holiday treat. But it didn't fit with Norway. I know, I know, mood reader nonsense! I adore this series so I'll finish it soon I expect. There's a tiny reference to Norway in The Hithhikers Guide to the Galaxy. But also, this is one of those books that I haven't read yet but know that I'll really enjoy. I was just delaying reading it for some reason or another. And with one of my reading goals for 2017 being to stop this, why not bring it along? I didn't get around to it, but I have one more holiday this year and this is coming with me. I am determined to finish this series this year. 2017. The year Imogen finally finishes the Chronicles of the Invaders. Even if I have to drag them all around the world with me. This is being released in a couple days and I am so excited! I actually headed down to London last week for the launch after meeting Felicia in February and getting a sampler of her debut. I wanted to finish it after starting it at home but couldn't find the focus while I was away. This of course, came back as soon as I touched down on British soil but the book went on a nice holiday I guess! So, out of the 800+ books I own, none of them are set in Norway! The closest I could get was this, which is a mystery/spy/thriller that starts off in Sweden then continues around Europe. I've been meaning to read this for a few years but still haven't. Maybe a trip to Sweden is in order. Have you ever been to Norway? What do you think of the books I packed? Book Review: The White Road by Sarah Lotz!